Me participating during class in one of the dimly lit corners of the classroom. As I entered the hallway crowded by students in khaki pants and polo shirts, I overheard several students making a boisterous exit from another class. The class they were filing out of was in an extremely narrow dark hallway. They left the class snickering and talking to some of my classmates about how funny it was to see the frustrated teacher. At the moment, I was frustrated at the other class because of how they left their mess to us. As I maneuvered through a smothered crowd of backpacks and lockers, I thought that a teacher who is coming off a disruptive class is not likely to have a positive attitude when mine walks in. The last few students who trickled out of the classroom were asking the teacher about the late homework policy. My classmates and I filed in and went to our seats without instruction while a few others made use of the five-minute transition period by using the bathroom or making casual conversation. As we entered the room, the teacher, Ms. Tserkovnyuk, shuffled papers on her desk and started instructing students to have a seat, be quiet, and begin their in-class assignments.Â This did not sit well with my classmates as they started arguing that the transition period was still underway.Â Regardless, we settled down and began to work. I quickly read and re-read the first question on the half-sheet of paper to be sure about what it said. I looked up amidst the constant sound of scribbling and pleasant tapping of lead to paper and noticed a friend turning around in her seat. Sitting in the front row made her an easy target for the teacher to spot, especially when the teacher had been heckled in the previous period and was primed for class disruption.Â I could see what was coming. Sure enough, the teacher told the student to please turn around and to stop disrupting class, for the work is not a group activity. The student made an irritated sigh before turning around and saying that she is only asking for help, not gossiping. The teacher persisted. No matter what the communication, she wanted a silent classroom. After another response, the student in the front row hushed and started her work dejectedly. After a minute or two, another friend by the wall of the classroom started laughing with another. The teacher pleaded for us to be quiet once again, but this time she did it in an a tone that made it sound as if she were about to break into tears.Â I stopped my work and looked up with a genuine sense of astonishment and sympathy for the teacher. Then, she confided that she had had a tough morning. She mentioned the frustrations she experienced with the previous class. She surprised me, and probably the whole class by going into detail about the frustrations of her personal life at home. She said that her husband had to leave early for work, so she had to prepare her children by herself for school. She apparently also received a call from her daughterâ€™s school that her daughter was sick and needed tending to. Everyone promptly settled down once more. She settled back into her desk, shuffled a few papers and started typing into her laptop again. 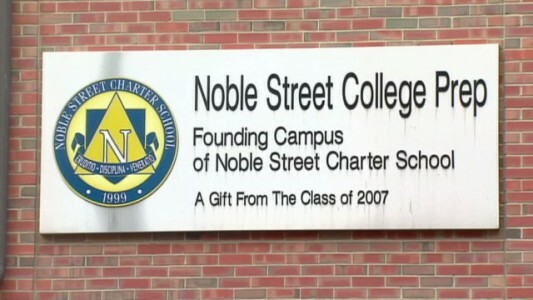 The Noble Street College Prep plaque outside of the building where Russian class was taught. moved to the United States in her adulthood. After studying at the University of Wisconsin in Madison, she taught Russian language to us at Noble Street College Prep. She didnâ€™t return for my senior year. Just as well. I wouldnâ€™t have taken classes from her anyway. Ms. Tserkovnyuk had been through a lot in life and had experienced the Cold War from both fronts. My class, me included, had only known our small world within that school and the goal mostly of trying to get to the end of the day. The class and teacher just couldnâ€™t relate.Â I could almost say we, the students, didnâ€™t know better, but it seemed more to me that both sides just didnâ€™t know enough about each other.